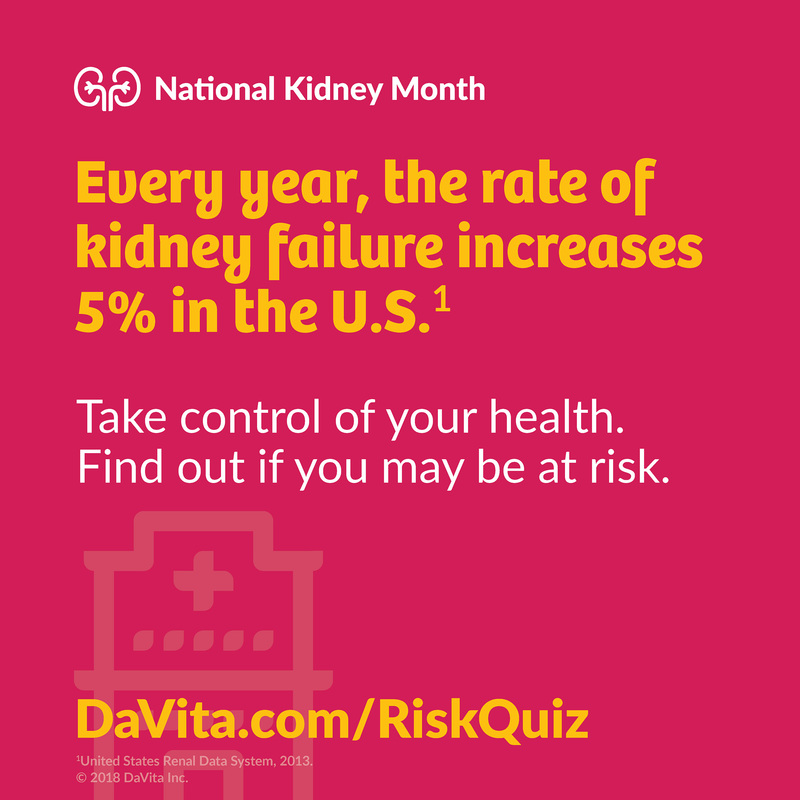 DENVER (March 1, 2018) – DaVita Kidney Care, a division of DaVita Inc. (NYSE: DVA), a leading provider of kidney care services in the United States, is empowering individuals to learn more about their risk for kidney disease and take control of their health. 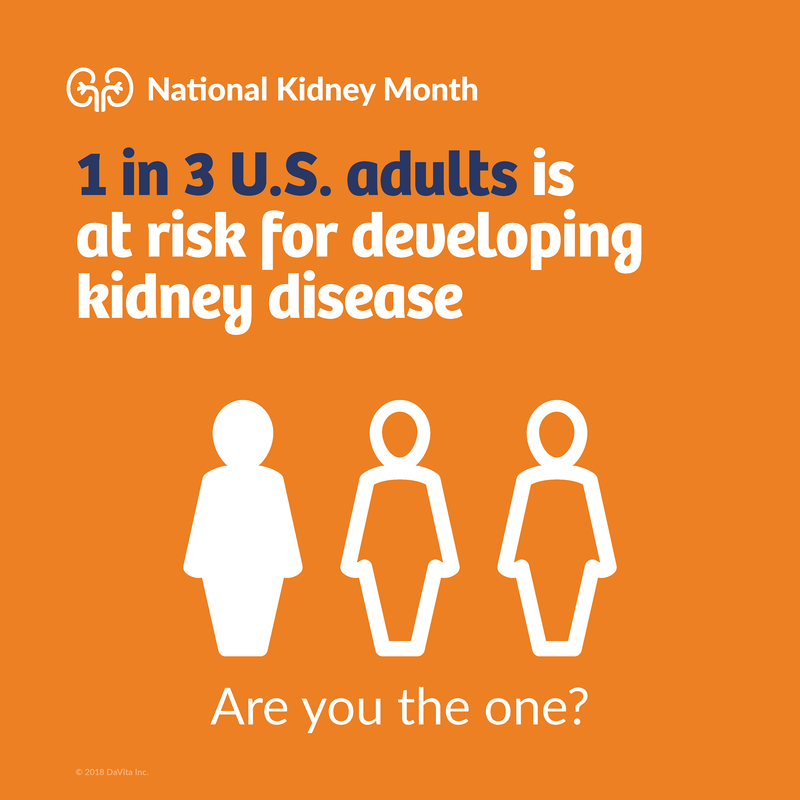 The company is expanding its effort to raise awareness about chronic kidney disease (CKD) – a condition that impacts more than one in seven U.S. adults and is the ninth leading cause of death in the country. 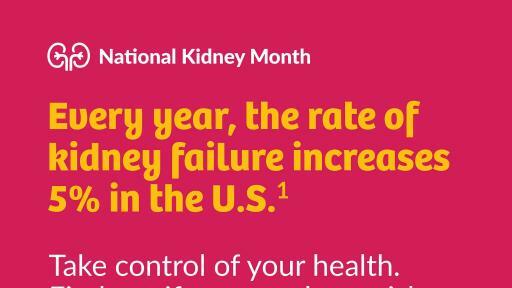 Every year, the rate of kidney failure increases 5% in the U.S. 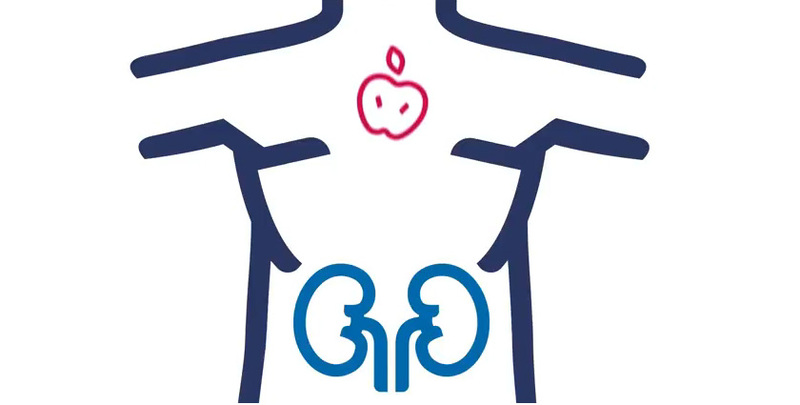 Kidneys are the body’s filtration system, removing waste and extra fluid while balancing chemicals that are necessary to kidney function. 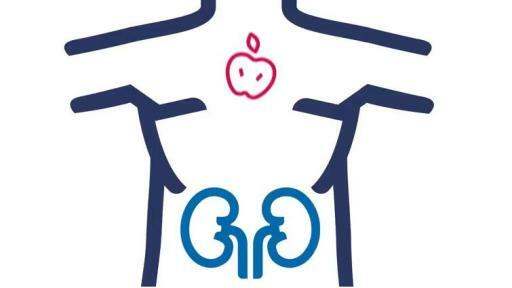 Individuals with kidney disease lose the ability to effectively remove waste from the body. 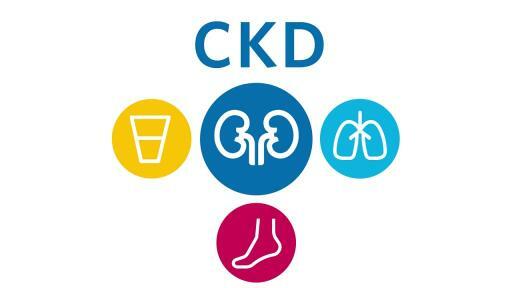 When CKD progresses to end stage renal disease (ESRD), dialysis or a kidney transplant is vital for survival. Diabetes and high blood pressure are the most common causes of kidney disease. 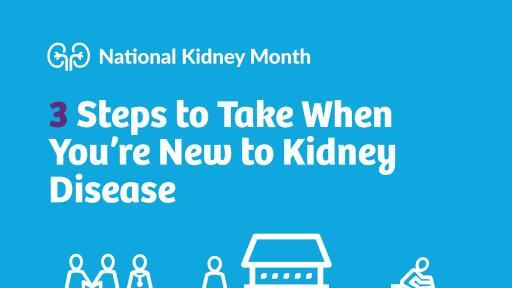 With kidney disease, kidneys usually deteriorate over time, though treatment has been shown to slow progression. Lifestyle changes, including eating healthy and managing medications may help CKD from progressing to ESRD and prevent other health conditions, like heart disease. 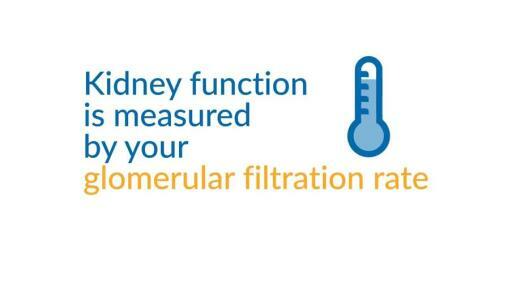 Women are three percent more likely to have CKD than men. 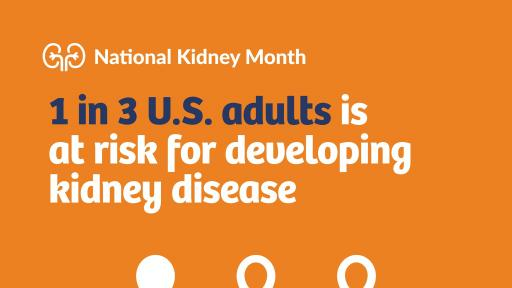 African Americans are more than three times more likely to develop kidney failure than Caucasians. Hispanics are 35 percent more likely than non-Hispanics to develop ESRD. 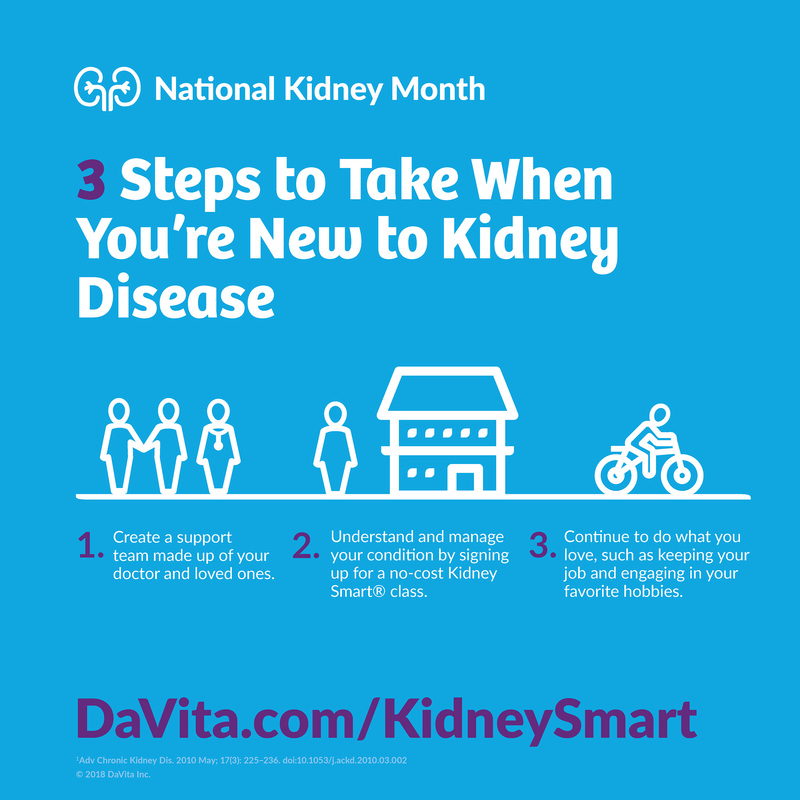 DaVita Kidney Care is a division of DaVita Inc., a Fortune 500® company, that through its operating divisions provides a variety of health care services to patient populations throughout the United States and abroad. A leading provider of dialysis services in the United States, DaVita Kidney Care treats patients with chronic kidney failure and end stage renal disease. DaVita Kidney Care strives to improve patients’ quality of life by innovating clinical care, and by offering integrated treatment plans, personalized care teams and convenient health-management services. As of December 31, 2017, DaVita Kidney Care operated or provided administrative services at 2,510 outpatient dialysis centers located in the United States serving approximately 198,000 patients. The company also operated 237 outpatient dialysis centers located in 11 countries outside the United States. DaVita Kidney Care supports numerous programs dedicated to creating positive, sustainable change in communities around the world. The company’s leadership development initiatives and social responsibility efforts have been recognized by Fortune, Modern Healthcare, Newsweek and WorldBlu. For more information, please visit DaVita.com.